Many people have been asking for LCHF food ideas. We find it tough making suggestions for vegetarians. But here are a few ideas that we have struck upon or found from other sources. More recipes will be updated from time to time. We are open to your ideas as well. Since full fat Greek Yogurt is not available here, we recommend a 50/50 mix of homemade yogurt with cream. Add grated nuts of choice, and a tsp of sugar free syrup like chocolate or strawberry. Chill & serve. Over high heat, heat the oil (bacon fat can be used here too) in a wok or large heavy frying pan and add the garlic. Stir-fry until pale gold. Add the meat and fry until lightly browned. Break in the eggs and fry until softly scrambled. Add the grated cauliflower, sprinkle with salt and stir and fry until it’s tender-crisp, about 5-8 minutes. The length of time will depend on the cauliflower. Stir in the green onions and the pepper. Check the seasoning and serve. Mix all together and place on a cookie sheet covered in parchment paper. Flatten it out with a spatula but firm up the sides. It should be 1 1/2 to 2 inches thick. Ok! Find something that looks like a piece of bread to cook in the microwave... I just use a little square Tupperware (plastic container). Melt butter to coat the bottom and sides. Put in the microwave for 1 minute. Turn over and cook for about 10 more seconds. Soften cream cheese about 40 seconds in microwave. Add other ingredients. Beat with mixer till smooth. Pour into 12 muffin pans lined with the papers. Bake at 350 deg F for 20 min. Boil chicken as much as required, chop into small pieces. Take a 1/2 stick of butter, lots of garlic, minced onion and let it simmer around under low heat for a while. Add about a cup of heavy cream, lots of pepper and all of the chicken. Let that cook so the fat would start coming out of the chicken. Pour a cup of Parmesan cheese shreds on top and cover. Stir it when it is all melted together. Add the gelatin to a medium size bowl and pour one can of coconut milk over it. Allow to sit for 2-3 mins or until gelled. Pour the other can of coconut milk into a sauce pan over medium-low heat. Add the gelatin mixture to the pan and whisk to combine. Boil tomatoes and blend and keep aside. In a pan, saute mushrooms, peas, onions and garlic. Add the tomatoes and add dried basil, dried oregano, salt and black pepper (crushed). Add silken tofu and mix. Blend it again in the blender and bring to boil. Add some of the green peas, mushrooms (or any vegetables that suit you) at the end and bring to a boil if you like whole vegetables in the soup. Its amazingly creamy. 2. Microwave the mozzarella and cream cheese until smooth. 3. Mix the cheese with the almond flour and egg. Add a few dashes of parsley, fennel and oregano. 4. Flatten out the dough on the parchment paper/cookie sheet. Use a sandwich bag for covering the hands so that nothing sticks. 5. Liberally sprinkle the crust with garlic salt. Poke the dough a bit with a fork to prevent bubbles. 6. Bake for 8 minutes, and poke any bubbles. 7. Bake for another 4-6 minutes until it is slightly brown on top. 8. Add any ingredients for your topping and then pop back into the oven to melt the cheese on top. In all it takes me less than 20 minutes to make and is the best homemade low-carb, gluten-free pizza yet. It's much easier than the cauliflower crust and holds up better too. The recipe below takes one egg and makes 2 pancakes. Double or triple it to make more. regular pancakes. Turn when bubbles appear at edges. About 300g Strawberries, blitzed to pulp in food processor/blender. Some completely vegetarian recipes. Substitute local or available ingredients where required. Heated your oven to 425 o F and cut the cabbage into 4 wedges. Lay the wedges on to individual pieces of tin foil large enough to totally encompass them and drizzle the marinade evenly onto the wedges before wrapping them tightly in the foil. Cook the wedges for 40minutes, but turn the oven off with about 15minutes left to go on the timer. When the timer goes off, remove and serve! Easy! 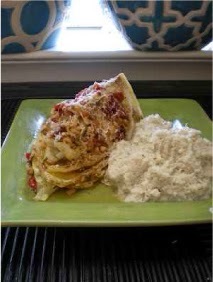 Top the cabbage wedge with about 1/2 tablespoon of finely grated Parmesan cheese, but it's definitely not necessary. When the cauliflower mash was done cooking in the microwave (10 minutes in microwave safe bowl that also contained the olive oil and minced garlic) transfer the cauliflower, the goat cheese, and the Greek Yogurt to the blender. Blend until a pretty smooth texture. The mash will be a little grainier than the mash if butter, heavy cream, and copious amounts of cheese are used. So if you want your mash to be super soft and silky you might bump up the fat content some to achieve that texture. Chop up the broccoli and stem. You can remove the end or any tough/woody portion of the vegetable. In a large saucepan, add coconut oil and mustard seeds. Once the seeds begin to splutter, add the onions, curry leaves, green chilies and a pinch of salt. Saute until the onions turn golden and then add garlic and ginger. After a couple minutes, add broccoli, stock and a pinch of salt. Bring it to a boil then lower the heat and let it simmer for 20 minutes. This recipe makes something along the lines of a basic cheesecake flavored "mousse". It's soft, sweet and tasty. This is quick, delicious, easy to make and holds well in the fridge for a few days. Usually one can make a batch and divide it into little plastic cups in the fridge. Ladle ¼ cup of the batter onto a greased frying pan on low-medium heat and allow the flat bread to cook until the bottom firms slightly, then remove and place on a large pan/plate. You should now have 6 little half-cooked naans/tortillas (if you have more… just eat one. You will need two naans/tortillas to make one stuffed flat bread). Place 2 tbs of cauliflower mixture on one piece of bread. Brush melted ghee around the naan (see the picture above) - then place another piece of naan on top of the cauliflower mixture - pressing the two pieces of bread together. Combine the coconut aminos, broth, vinegar, sesame oil, and date in a small bowl and set aside. Heat 2 tablespoons of coconut oil in a large skillet over high heat. 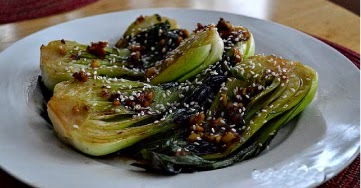 Place the bok choy, cut-side down, in the skillet in a single layer. Cook without moving until lightly browned (about 2 minutes). Turn the bok choy and cook until lightly browned on the other side, about 1 minute. Add 1 tablespoon coconut oil, garlic, and ginger to pan and cook for just a few seconds, then add the coconut aminos mixture and simmer for about 30-60 seconds or until thickened. Sprinkle with the sesame seeds, if using, and serve immediately. 1. Pre-heat the oven to 350°. In a small separate bowl mix together the ground flax seeds and warm water and let sit until it thickens and gels. 2. In a large mixing bowl or food processor mix together all the dry ingredients. 3. Melt the coconut oil, then place it along with the flax mixture, into the bowl or food processor and mix well. The dough will be thick. 4. Take a small bit of the dough and roll it into a ball then press down to make a cookie shape. Place it on a cookie sheet lined with parchment paper and repeat until all of the dough is gone. 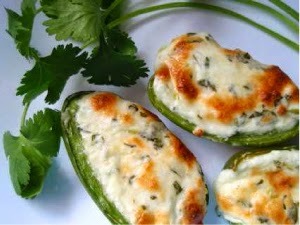 In a bowl, combine the cheese with the garlic, basil, salt, pepper and 2 tablespoons of the olive oil. Spoon the cheese mixture into the tomatoes, mounding the filling 1/2 inch above the rim. Cover with the tomato tops and drizzle with the remaining 2 tablespoons of olive oil. Slice zucchini crosswise into 1/4 inch thick slices using a mandolin slicer or a sharp knife. 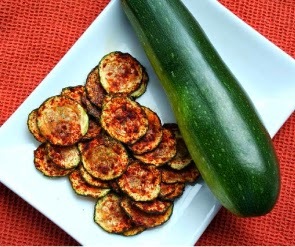 Place zucchini in layers into a colander or sieve, sprinkling with a little salt with each layer. Let drain one hour. Preheat oven to 250F and line a baking sheet with parchment paper. Brush parchment with 1 tsp of oil. Pat zucchini slices dry with a paper towel and place on prepared baking sheet. Brush tops with remaining oil and sprinkle with paprika and ground pepper. 1/4 cup chopped walnut or sunflower seeds. Mix in bowl and microwave for 60 seconds. Top with 1/2 teaspoon cinnamon and fresh blueberries (or berry of choice). Top with additional milk, if desired. 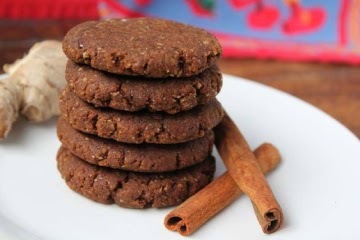 Can add stevia to sweeten if you like. • Put all ingredients in a blender or magic bullet. Blend until smooth. Let rest for 2 minutes so the bubbles can settle. Pour 1/4 of the batter into a hot pan greased with butter. Cook for 2 minutes until golden, flip and cook 1 minute on the other side. Repeat with the rest of the batter. Serve with sugar free syrup (or any syrup of your choice) and fresh berries. Heat the milk in a small sauce pan and add in the remaining ingredients, cook on medium heat until it reaches the desired thickness. Panna cotta (from Italian cooked cream) is an Italian dessert made by simmering together cream, milk and sugar, mixing this with gelatin, and letting it cool until set. This chilled dessert is then served with wild berries, caramel, chocolate sauce or fruit coulis.check out the modified version to suit your lifestyle. 1) Warm the coconut milk slightly and add the agar agar flakes and let this sit for 15 Minutes, till the flakes are softened. 2) Now simmer in the stove on slow to medium heat and add the xylitol to dissolve at this stage. Do not allow it to boil, but simmer till the agar agar flakes dissolve. 3) Once the flakes are completely dissolved, remove from the stove add the vanilla extract and pour the contents into small cups and allow it to set. Chill and serve with sugerfree chocolate sauce or , with nuts and fruits of your choice. Caprese Salad - 1 small roll of Mozzarella cheese (100gms approx), 1 whole medium tomato, Spring onion- 1 piece, Handful of basil leaves, balsamic vinegar, olive oil, salt, pepper and oregano powder. No cooking and stress free. Assembly time :- 5 minutes. Suitable for vegetarians. Slice Mozzarella and tomatoes into thin slices and assemble on plate. Sprinkle finely chopped spring onion. In a bowl, whisk together balsamic vinegar, olive oil (extra virgin if available), salt as desired, pepper as desired and oregano powder. Drizzle over salad, Add basil leaves and enjoy. This salad can also be made with mini mozzarella balls and cherry tomatoes on toothpicks as finger food with drinks for a party at home. Mini mozzarella balls/mozzarella chopped into small pieces with cherry tomatoes and basil leaves on a toothpick. LCHF Starter/finger food for parties. Sorry image did not load. Yes, I think that the template that I'm using to post the blog, does not permit pictures or other media. I'm toying with the idea of moving the blog to an independent website. Once that is done we'll have more options & freedom with the content. Maine Flax seed meal powder se Methi ke paratha (bread) banaya..Same recipe of "Low carb bread"..usme baarik chopped methi,green chillies & garlic baarik,1 lemon juice,salt & half spoon sugar free powder to balance with lime..sab mix karke bread banaye..
Is it true that"Golden flaxseeds contain more protein than brown flaxseeds with less Omega 3 essential fat " ? Flax seed is also known as Linseed. It is grown in abundance in the Canadian grasslands. According to the Canadian Flax Council there is no difference in the nutritional composition of either of the seeds. There is another yellowish seed, Solin that looks like flax seed and is a genetic derivative of flax. If you are talking about Solin then that is an inferior seed.